This is such a beautiful day I thought as I drove towards home after dropping my grandson off at school. The sun was shining brightly. The clouds were putting on a wondrous display in the blue sky and the vibrant colors of fall shone all around me What a wonderful day to be alive! It’s the last day of October I thought. Yes, most call this day Halloween but it is more than that. This is a day the Lord has made. The world has labeled it “Halloween” but the Lord has given it to be so much more than just a day for tricks or treats. He has set before me a day full of beauty and color. What shall I do with it? I must make a choice I thought, for October 31, 2011 will never be again after today. My homework is done, I have no immediate plans, the day is laid out before me, a canvas of color to make mine. I can’t help myself–I decide to enjoy it! As each fall scene came across my path on the drive home, I stopped to take a photograph of it. Then, once home I chose to take a walk to further enjoy the day. This created an opportunity to take some more photographs of colorful displays in my neighborhood. The experience was rewarding. The crunch of colorful leaves under my shoes, the sound of birds chattering in the trees, a leaf covered with dew on the green grass, a bee enjoying his day visiting a lonely dandelion, mushrooms hidden beneath the stairs, summer’s colorful flowers slowly submitting to fall, and colorful fall yard displays all made for a delightful walk. All this, I thought in one tiny area of my small part of this wide world. What a treasure I would have missed had I chosen not to participate in all this day beheld. I didn’t want it to end, but as the sun went into hiding and the clouds turned gray, I realized the time had come to head for home and record the memories. 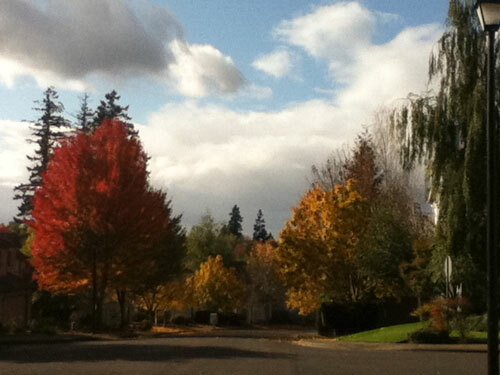 The sunshine, marshmallow clouds and trees dressed in their colors of fall on October 31, 2011 may not come again, but the photos I took will preserve this day for me and others to enjoy whenever we might choose to do so. If you were not able for some reason to be outside to enjoy this day or if you chose to but didn’t have a camera with you to record it, I hope you will take the time to enjoy my day with me. Just sit back and take a moment to view the slideshow Autumn’s Bountiful Colors Web Gallery that captures the wondrous works of God. Push the pause button to read the inspirational quotes if you need to. Take your time and enjoy! The works of His hands are on display! Rejoice and be glad ! I love your blog my friend, so I’ve nominated you for the Liebster Award. Thank you friend. I appreciate that!